Just unpacked the new improved DZ500 & gas flush Double Chamber Vacuum Machines. These machines feature better finishes on the machine body, a digital control panel, simplified elctronics, easier access for servicing, easier lid adjustment and an external main switch for safety. 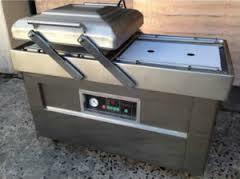 THERE IS A TREMENDOUS INTEREST IN THESE MACHINES AND THEY ARE SELLING FAST. CALL PACKIT NOW TO SECURE YOUR ORDER.